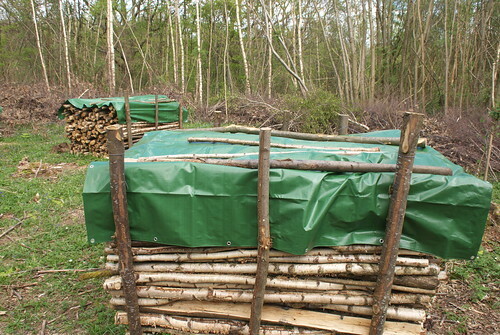 Swings and roundabouts... We've been supplying our own logs for home heating for 4 winters now, and supplying other people for a couple of years before that. We've tried it both ways, cutting to length and splitting on a block (though I'd not seen the tyre idea back then), and what we do now, splitting full length and cross-cutting later. 1. The sooner the wood is split or cross-cut, the quicker it will season. Splitting is better than cross cutting at speeding up seasoning, as it opens up more surface area in the wood. 2. If we cross cut (and perhaps split) all our wood immediately after felling, we'd have two problems: First, we tend not to take a vehicle all the way to where we're felling, to avoid trashing the tracks when they're muddy, so we need to store the felled wood near where it's cut - that's harder to do if the wood is cut to final length. 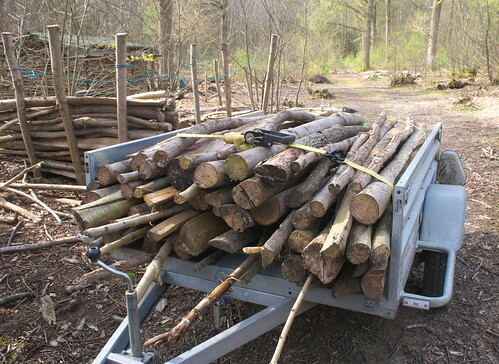 Second, even if we did take a vehicle right up to our felling area, we'd still have to find somewhere to store the cross-cut logs in the woods - we only have space to store about 2/3 of a winter's wood at home. So by splitting it I can start it seasoning where it is, and it's ready to burn after cross-cutting. Also, splitting right after felling (or at least within a week or two) means that the wood splits relatively easily - apart from hornbeam of course! If I had space for two years' firewood at home, then yes, I may well take the logs home unsplit, and split them after running them through our Truncator. But we don't, hence the current method. One other upside of keeping them long - we use 15" logs at home (stove will take max 17", so that leaves a bit of leeway), but most other people round here prefer 12", or even 10". Although we burn most of the wood we cut ourselves, we do sell the odd load to other people - by leaving the logs long, I can ask them how long they would like their logs, and then cross-cut my ready-split logs to suit them. I've even been in and measures their stoves when necessary! Sorry, I seem to have rambled on a bit! If people didn't ramble on the forum would go silent very quickly. You seem to have well though out reasons for your choices and your conditions are your own not mine. One thing you didn't mention is the possibility of theft when your not on site. Most crooks want their free wood cut and split to size so would never nick a two meter log. I depend on my reputation of being able to shoot a running deer at a hundred yards and willingness to do the same to a thief to keep my wood piles where they are until I come to move them. As VT says, Mike, it's a case of horses for courses. And by all of us rambling on about what we do and why it gives novices the chance to gauge the best practice for themselves. One thing you didn't mention is the possibility of theft when your not on site. Most crooks want their free wood cut and split to size so would never nick a two meter log. I depend on my reputation of being able to shoot a running deer at a hundred yards and willingness to do the same to a thief to keep my wood piles where they are until I come to move them. Mind you, I heard of one incident not too far away where someone stole trees - i.e. they cut them down and took them away! Probably then processed them and flogged them green to some unsuspecting punter... Seems daft though, as coppice trees themselves don't have much value - it's the work of cutting them that adds value. Here the big dogs would run a sheer through the coppice and mow it flat and feed it into a big chipper. Hardwood chips at going for $34/ton at the mill. The equipment and the trucking eat up a lot of that so the land owner might get just $10 / ton stumpage. On the other hand that wood as you have it split, cut into 16" stove lengths will bring $225 a cord green and $275 to $325 dry depending on where you deliver it to. So about $20 per cord standing on the stumps and $200 worth of work getting it cut and split at the landing ready to sell. A little guy can make ends meet if he owns the land but you will never get rich at it. This is a fantastic idea for cutting branches. After wasting well over a year over-thinking, I have decided to go the low tech route and therefore purchased a 21" bow saw for the larger wood, and a couple of pruning saws for the small stuff. I rejected a chainsaw on safety, cost, and noise grounds. With aid of a cheap folding saw horse, I have found wood cutting easier than expected, though it is mainly fairly small stuff. I have just been given a ton or two of waste wood from demolition, that should keep me busy for a bit !